Recipes using greengages in the ingredients. 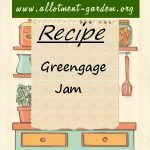 Recipe for Greengage Jam. Greengages usually have enough pectin to ensure a good set. Makes around 6 lbs (2.7 kgs) of jam.